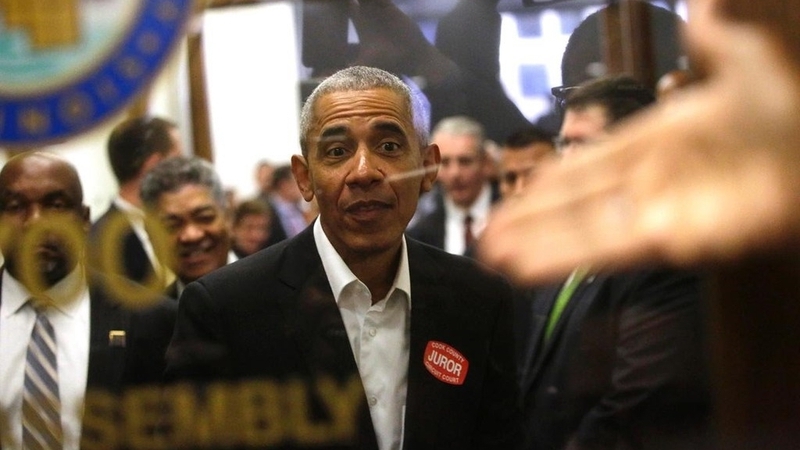 Report: an infamous 19th century Irish-American murder trial in Chicago shows that Barack Obama may have a lucky escape when he was not selected for jury service By Gillian O’Brien, Liverpool John Moores UniversityLast week, Barack Obama turned up for jury duty at Cook County’s Daley Center courthouse in downtown Chicago. He was, rather unsurprisingly, not selected to serve and was on his way home by noon. Obama isn’t the first man to be rejected for jury service in Chicago. In 1889, it took almost two months to select the twelve man jury for a murder trial. The victim was an Irish doctor called Dr Patrick Cronin and it was one of the most sensational crimes to take place in 1880s Chicago. The victim was found beaten and naked in a Chicago sewer in May 1889. As rumours abounded as to who had killed him, the press enthusiastically regaled their readers with allegations of corruption and conspiracy. It became clear that Cronin had been murdered as a result of a feud between two sides of the Irish American republican organisation Clan na Gael and by the autumn of 1889, five men stood charged with Cronin’s murder. But by the time the Illinois state attorney was ready to bring the men to trial, it was almost impossible to select a jury because almost everyone in Chicago had already made up their minds about the case. From May to December 1889, thousands of newspaper reports and editorials had been dedicated to the Cronin murder. Every twist and turn of the investigation was closely scrutinised by a press and public who were fascinated and horrified in equal measure. For many Americans, the murder was proof that the Irish Catholic population in the United States could never truly assimilate and become American as they always had an eye to fight for Irish freedom. While this could be ignored when that fight took place overseas, it could not be tolerated when murders began to take place on US soil. Newspaper coverage of the case was sufficient to convince many Chicagoans that the accused men were guilty before the trial had even begun. Between August and October, 1,115 men were interviewed as potential jurors. It was, at the time, the largest and longest jury selection process in US history. As the weeks passed, The Times mused that the accused men were “doomed”, for “if they do not die by verdict of jury they are in a fair way of dying of old age before a jury is chosen”. The process proved both lengthy and controversial. Potential jurors were asked questions which tried to ascertain if they held prejudices against Catholics or Irishmen, and whether they had already formed an opinion about the case. The defense argued, quite plausibly, that there were few Chicagoans not already intimately acquainted with the case thanks to the intense media coverage. Thomas Nast was the most influential cartoonist of his generation and he had been drawing anti-Catholic and anti-Irish images from the 1860s. At the time of the Cronin murder, he was based in Chicago working for America and his cartoon, “No Upright Judge”, referenced the much-discussed issue of jury-bribing. It shows a man brandishing a pistol and holding a scroll relating to the Cronin case. His gun is pointed at Justice who stands blindfolded, with her arms raised and her scales of justice and her sword tumbling to the floor. Around her men flee the courtroom. Many of America’s illustrations mocked the jury selection process and the close connection between the Clan and the judiciary. The Chicago Tribune also took a dim view of the process. In its cartoon “The Devolution of a Jury”, potential jurors become more and more simian as supposedly intelligent men are overlooked in favor of the pliable. The issue of reporting on cases before they come to trial is one that is very current today, particularly in relation to social media. It was also an issue in 1889, but the papers rarely alluded to the fact that comprehensive newspaper coverage of the case made it virtually impossible to find 12 men who were not already convinced of the guilt of those accused. In one article, “How newspaper reports are to be read”, the Tribune defended the press from any charge that newspapers might prejudice the trial. The paper was at pains to point out that the papers had changed their opinions as the evidence changed. “Intelligent men read the newspaper accounts of the Cronin case merely as the best information then at hand, and any opinions formed were subject to any modifications or change which further evidence might prove necessary.” With staggering audacity, the paper concluded that the defendants would get an impartial trial despite the enormous amount of press coverage. Eventually on October 22 1889, 12 men were sworn in and the trial opened the following day. Such was the interest in the trial that 5,000 members of the public attempted to gain admission to a courtroom that could accommodate 200. Perhaps Obama was fortunate. Some of the men called for jury duty in late August 1889 did not get to return to their normal lives for five months as the trial continued until Christmas. Indeed, not all returned to their normal lives as the trial verdict proved controversial and some jurors were so vilified by the public that they were forced to leave Chicago. An important chapter in Irish American life in Chicago. Francis O’Neill, as an Irish American policeman in Chicago, would have followed this case with great interest. Yes, he would. I’d be very interested to know he thoughts about the whole affair. He doesn’t seem to have had any connection at all with this case, but no doubt he would have been following it closely – particularly as it reflected very badly on Irish officers in the police force.